While you'll probably have to wash a pair of muddy jeans, if they've just gone through normal everyday use and aren't stained, there's a super simple way to kill odors and bacteria on them without any washing at all. The reason jeans start to smell after being worn for a while is because bacteria transfers from skin to the denim. The majority of those bacteria can be killed by the low temperature in your freezer, getting rid of the odors they cause as well. 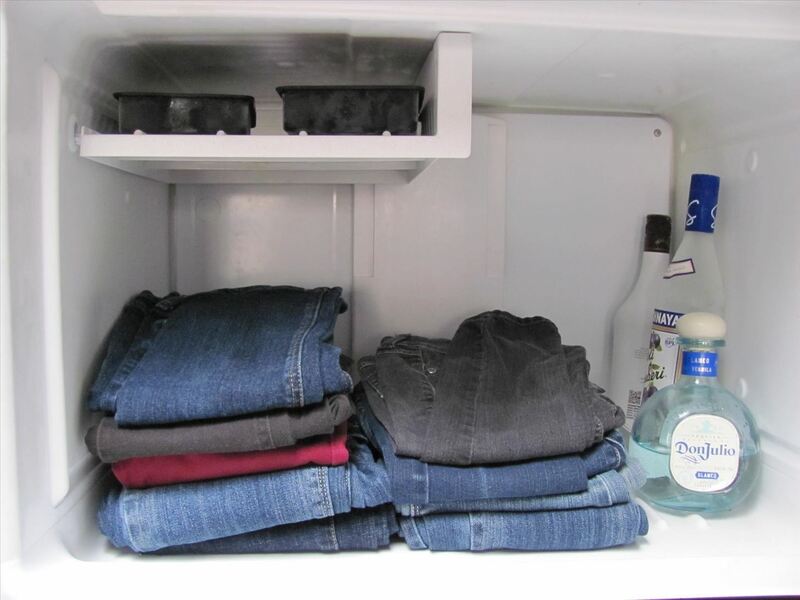 All you have to do is put your jeans in the freezer before you go to bed. Elle talked with Jill Guenza, VP of Women's Design at Levi Strauss, who said that freezing them overnight is long enough to kill the bacteria. If you want to put them in a bag, it's best to use cloth or canvas as opposed to plastic so the denim can breathe. But you can also skip the bag altogether and just throw them in on their own. Denim stretches out from being worn over time, but if you want to give your jeans their shape back, just turn them inside out and pop them in the dryer for about 20 minutes. If you get a stain, the occasional wash won't do much damage, so don't be afraid to do so if they need really need it. Well, this would keep the jeans from stinking so soon, but freezing does not kill germs. It only slows them reproducing. I'm pretty sure the bacteria lives on our skin BECAUSE of of our temperature. Get the bacteria below what it's used to, and bad things will happen to them.